Les Lauriers de Magnot: What is the role of the CIO/IT Director? What is the role of the CIO/IT Director? 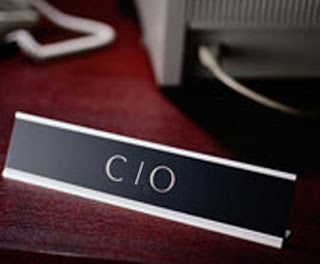 The role of the CIO/IT Director is to act as the business owner for IT, ensuring that whatever competitive advantage or operational efficiency that might exist, is identified, prioritised and implemented. With the increasing emergence of ubiquitous technology, the danger is that for IT leaders who fail to grasp the challenge, they will be usurped by their colleagues in finance who albeit mistakenly believe good IT is easy and who will then take those decisions unilaterally, leading to poor IT decisions. In my opinion, it is the age old argument between "IT and the business", it is a misnomer. You do not hear "Sales and the business" or "Finance and the business", IT leaders need to wise up and realise they ARE the business and take ownership, be business leaders first and technologists second, just like their boardroom colleagues are in their respective disciplines. Unless you can achieve this, then you are the biggest threat to the long term health of IT in your business.